From time to time, we open Worn & Wound up to fellow enthusiasts, collectors, and niche specialists who want to write about a watch or subject we have yet to cover. Today, we’re featuring a guest post from Jarett Harkness, who’s going to tell us all about Hamilton’s important, and often underappreciated, foray into electric watches. And Jarret’s the right person to do just that. He began collecting and restoring Hamilton “Electric” watches in the 2000s, eventually training under the famed Rene Rondeau. Beginning in 2011, Jarett moved from working as a pharmacist to restoring Hamilton Electrics full time. When Rondeau retired in 2015, Jarett purchased the business and inventory, and today he operates his website, unwindintime.com, offering restoration of Hamilton Electrics for clients and sales of restored Hamilton Electrics, as well as other vintage watches. Hamilton Watch Company created a true icon with the 1957 introduction of the Hamilton Electric watch. It was the first significant innovation in mechanical design since the 16th century. Before 1957, all watches supplied power via a mainspring through either hand winding or kinetic energy (wrist motion with an automatic watch). The Hamilton Electric looked toward a different source, which resulted in a mechanical movement being powered by “an energy cell no larger than a shirt button,” as Hamilton once described it. Although the Hamilton Electric is powered by a battery, the operation is largely mechanical, using no transistors or other electronic components. It marks the first step toward the modern battery powered quartz revolution. When it comes to the story of the Hamilton Electric, separating fact from fiction can be difficult, especially when some of these misconceptions have been circulating for sixty years. One pervasive misconception is that the watches never worked, or never worked well. And yet, countless examples can be found with original movements, and with watches used so extensively that holes have been worn completely through the cases. It takes years of continued use to cause this sort of wear, and, simply put, people were not strapping watches to their wrists every day unless they were running properly. Hamilton also produced approximately 350,000 Hamilton Electrics over a twelve year run. If these were duds, production would have been discontinued much sooner. Now, that’s not to say that there weren’t some reliability issues with early models (I’ll discuss that a little later), but it was Swiss competition and the coming quartz revolution that ended Hamilton’s Electric production, and not some inherent flaw in the product. It’s also been said that the Hamilton Electric put the Hamilton Watch Company out of business. But that’s also not true. Hamilton, as many of you know, moved operations to Switzerland in 1969. They are now a part of the “Swatch Group” and have not missed a day of watch production since the company was founded in 1892. Another prevailing myth is that no modern batteries are available for the watch. However, a readily available modern 387S battery will work in all three movements—the 500, 500A (virtually identical to the 500), and 505. From a marketing standpoint, the wisest thing Hamilton did concerning the Electric project was, in fact, the case. The Electric team realized that the exterior housing this revolutionary movement should look as modern and futuristic as the movement inside. The 1950s were a time of great post-WWII modernism, perhaps best exhibited in the era’s fascination with rockets, space travel, and the future. Hamilton capitalized on this in a couple of important ways. First, they hired a well-known automotive designer, Richard Arbib, to design cases that would reflect Hamilton’s forward-thinking vision. Arbib believed that all aspects of the watch—the strap/bracelet, case, dial, and hands—should be coordinated. The Ventura is the best know example of this philosophy, but in my mind it’s the Vega that best exemplifies Arbib’s vision, with its dynamic cross-hatch pattern flowing through the bracelet, into the lugs, and through the dial. Hamilton launched the watch by staging an elaborate press conference on January 3, 1957 at the Savoy Plaza Hotel in New York City, where there were over 120 reporters in attendance. The press release was published in over 500 newspapers across the country. Radio and magazine advertisements followed with futuristic themes, and specialized displays were sent to Hamilton retailers to tout the new invention. The future was here, and Hamilton wanted to stake its claim in ushering it in. Hamilton did, however, make some critical mistakes at this early stage. They were in a race with Elgin and Bulova to be the first to market with an electric watch. Elgin announced their “Electronic” watch in 1952, but it was not released until 1961, and, simply put, the product was a disaster. So much so, in fact, that the model was quickly and quietly withdrawn from the market. The Bulova Accutron, however, turned out to be Hamilton’s most formidable opponent, but it was not released until 1960. In their haste, Hamilton basically released a prototype movement to the market, and to further complicate matters, they had not made any real effort to train watchmakers in servicing the movement should something go wrong. In fact, the first comprehensive repair manual for the Hamilton Electric was written by a brilliant watchmaking instructor, William O. Smith, Jr., who purchased a Hamilton Electric watch, studied it, and spent a week at the Hamilton factory speaking to engineers and watchmakers. With Hamilton’s approval, he published a manual in 1958, and after review, Hamilton purchased the rights to republish the document. Sadly, it was too little, too late. Most watchmakers were already frustrated with the movement, which helped fuel the myth that the watches did not run. Around this time, Hamilton had already begun work on improving the caliber and in 1961 released the 505, which featured vast improvements to the contact system. Had Hamilton known that they had until 1960 to introduce the watch and still be first to market, they would have had a much smoother launch. 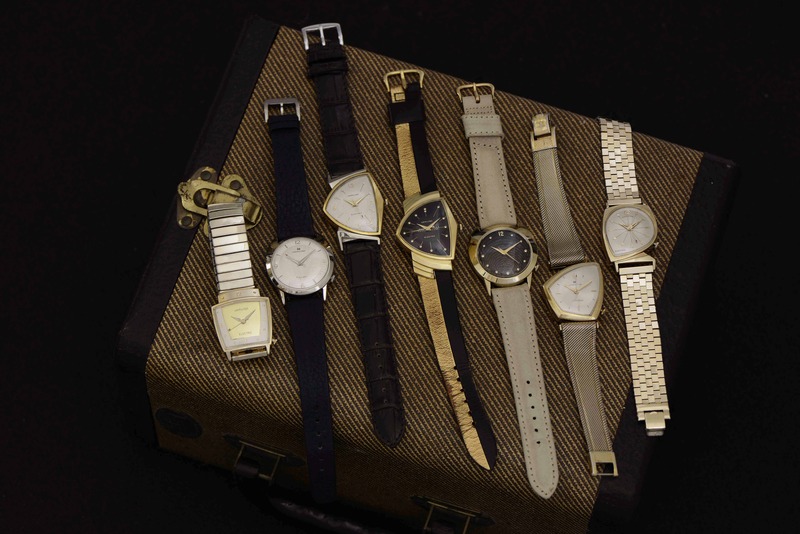 Other popular Arbib designs include the Spectra, Saturn, Meteor, Everest, Altair, Pacer, among several others. With the history out of the way, let’s dive right into the mechanics of the thing; how does an Electric watch work? First, let us quickly review the mechanics driving your classic mechanical watch. The stored energy of a wound mainspring, otherwise known as potential energy, drives a train of gears to which the hands are attached. An escapement regulates that train by transmitting the power of the mainspring to a balance wheel, causing it to oscillate at a specific rate, locking and unlocking the escapement. The speed at which the hands turn is regulated by the frequency of the oscillations of the balance. Now on to the physics of an Electric movement. We have all probably played with magnets as kids, and we know that magnets can either attract or repel one another. Couple this with the fact that if an electrical current passes through a wire or a coil of wire, a predictable magnetic field is created (this is the basis of how modern electrical motors work). In effect, a magnet can be created from a coil of wire that can be turned on and off like a light switch. The Hamilton Electric has two permanent magnets placed into the pillar plate below the balance wheel, creating a stationary magnetic field. Part of the balance wheel contains a coil of wire. At a specific time in the oscillation of the balance wheel, contact is made with a lead from the battery. This energizes the coil on the balance wheel and creates a magnetic field. This temporary magnet can move since it is attached to the oscillating balance. The coil and the permanent magnets in the pillar are configured to cause the same phenomenon that happens when you try to push two magnets with like poles together—they repel one another. This repelling force creates an impulse that causes the balance wheel to continue to oscillate, which is similar to the force of the mainspring that causes the balance to oscillate in a mechanical watch. The balance then acts as its own switch, energizing the coil on each clockwise pass over the permanent magnets for a split second when the contact touches the battery lead, creating this magnetic field. The power of these oscillations are then used to turn a train of gears attached to a set of hands at a specific rate. The iconic status of the Hamilton Electric, and particularly the Ventura, was in part because of celebrities like Elvis Presley, who owned many Ventura watches and wore one in the 1961 movie, “Blue Hawaii.” He often gave them away as gifts, as evidenced by the below example I recently received for movement service. Even today, the Ventura is often referred to as the “Elvis Watch,” and Hamilton has capitalized on this through numerous reissues. The Hamilton Electric also owes a debt of gratitude to Rene Rondeau, who became intrigued with these watches back in the 1980s. He did extensive research, interviewed former Hamilton employees involved in the project, and trained under Jim Reese, one of the original master technicians involved in the service and repair of these watches. Rene used this information and training to write an extremely comprehensive book, now in its fourth edition, “The Watch Of The Future: The Story of the Hamilton Electric Watch.” If it had not been for the efforts of Rene, the intriguing story of the Hamilton Electric would likely have gone away with the passing of the Hamilton employees involved with the project.